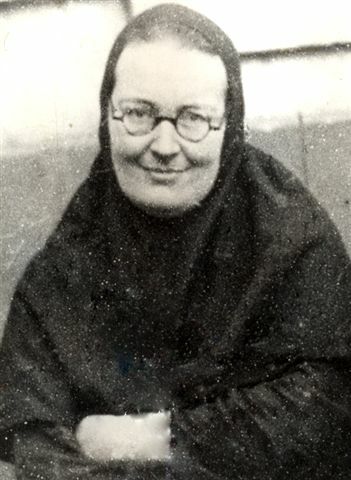 The holy and glorious venerable-martyr Maria Skobtsova (also known as Saint Mary of Paris or Mother Maria of Paris) was a nun and martyr in Paris in the early twentieth century. She encouraged hospitality and love of one's neighbor, often in the most uncompromising of terms. Kuzmina-Karavayeva (Кузьмина-Караваева) by her first marriage, Skobtsova (Скобцова) by her second marriage, was a Russian noblewoman, poet, nun, and member of the French Resistance during World War II. 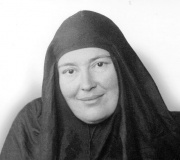 She has been canonized a saint in the Eastern Orthodox Church. … we see the humanity of Christ, the Church of Christ, the Body of Christ, to which the Mother of God is likewise Mother. And this expression is not only a certain bit of pious lyrics, — it also precisely corresponds to the very understanding of the Church as the Body of Christ. And if so, then also in relation to the Church as eternally alive is that, which She experienced in relation to Her own Son. The Mother of God-manhood — is the Church, She also at present is pierced through by the torments of this Body of Christ, by the torments of each member of this Body. In other words, all the innumerable crosses, raised up by mankind upon its shoulders, in order to follow after Christ, are turned into a likewise innumerable number of swords, eternally piercing Her maternal heart. She continues to co-share, to co-feel, co-suffer with each human soul, just as that selfsame day on Golgotha. This is a main thing. And in this sense She always goes with us along our own way of the cross, She is always here, alongside, and our every cross — is Her sword.